Indy has traded up from tangling with nefarious Nazis in the `40's to combating surreptitious Soviets in the `50's. Harrison Ford triumphantly returns to the role of Indiana Jones in the fourth installment of this popular American hero. George Lucas and Steven Spielberg have reteamed to bring audiences this major blockbuster almost two decades after we last saw Junior on the trail of the Holy Grail. 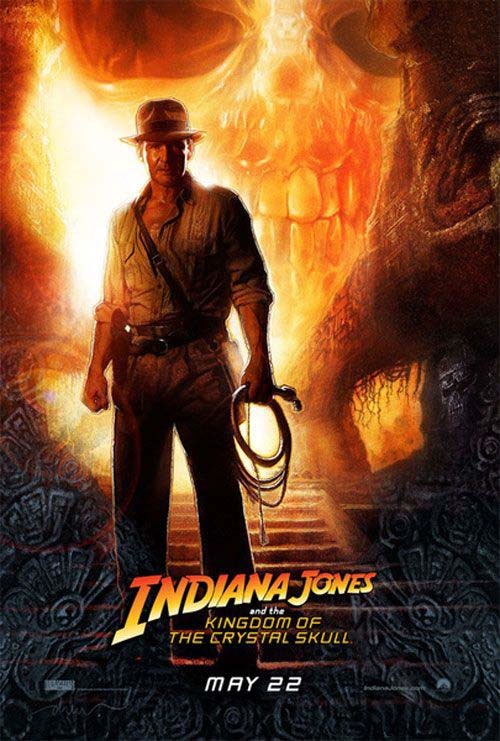 Indiana Jones and the Kingdom of the Crystal Skull finds Professor Henry Jones, Jr., being accused of Unamericanism during the height of the Cold War. Agents of the Evil Empire are up to no good and force the resourceful Indy to prevail in their quest for a catalogued crate. His scholarly knowledge is utilized by the Soviets to uncover clues in determining the whereabouts of an otherworldly wealth of antiquated treasures and extraterrestrial power. Indy #4 has a fantastic premise that hiccups from a weak plot with impressive sets and an exotic locale that sends our hero to Peru for a tropical adventure. There is plenty of outrageous action sequences that stretch the imagination. The heroine Marion Ravenwood (Karen Allen from 1981's Raiders of the Lost Ark) returns as the lost love interest in this sequel to wrench a new wrinkle into the saga of Indiana Jones. Kingdom resembles a comic book thriller come to life. Always in need a trusted sidekick, Indy discovers he fathered a son "Mutt" Williams played by Shia LaBeouf. The two hastily form a firm bond as they endure multiple challenges together in their search to find a missing colleague. 19 years may have passed for us, but it's only been 10 years for Indy as we learn. Harrison Ford at 65 years of age showed no signs of celluloid aging whatsoever; requiring another leap into disbelief. Ford wanted to portray Indy as age-appropriate and performed many of his own stunts. Lucas & Spielberg kept the Indy chapters alive with The Temple of Doom (1984) and The Last Crusade (1989). If movie-goers watch attentively, they will detect fleeting cinematic glimpses that reference the previous Indy cliffhangers in the series. These nuances work for both the character and the audience.